We certainly have a big telescope at hand. The top of the Blend Block with Stephen wondering off into the distance. We used tomato stakes to get the vines above the probable frost zone. So, how many bunches does it take to make a bottle of wine? There are around 5,000 of them left in the wild, and some of them visit Bloodwood's wattles regularly each November. Riesling likes cool, well drained gravels. 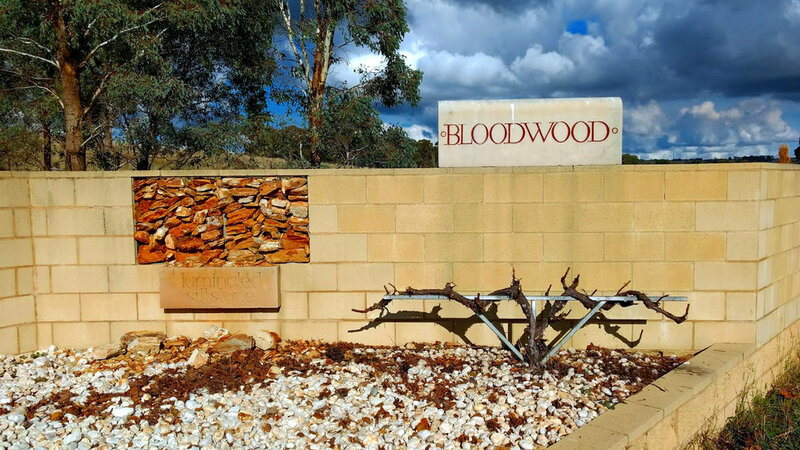 We have them in spades at Bloodwood. So, it's another sunset picture; but what a sunset. A real Galah sky. Our first weatherish-proof home. Now part of the winery. The smaller the sign the better the wine..not always. Our beautiful Cellar Door lovingly designed and painted over a decade by Wayne Harris. or Murrumbidgee Bluebell flowering along the creek. An abstract experience. We planted orchard trees to entice the birds away from our grapes. Results are inconclusive. This is what happens when your neighbours Hereford bull jumps your fence. Poor old Daisy. You can have today off Stephen. 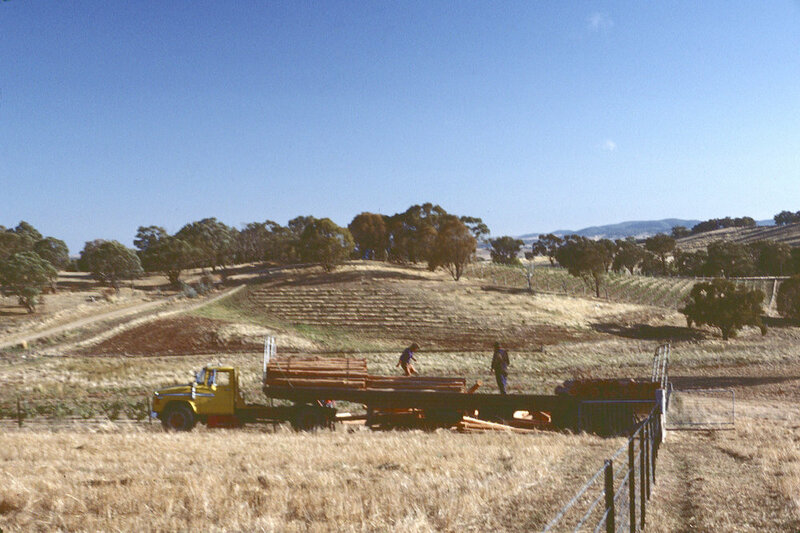 We use untreated iron bark posts when wood is called for. If you visit Bloodwood you get a job. Rhonda and Marty doing their dough. Ripping is the easy part. Planting can be back breaking. We have always raised a small herd of calves. Initially they were Hereford. Nowadays we run Black Angus. Some winter mornings it is better to stay in bed. We grew out cuttings for rootlings in our early plantings. Well, it is a statement that we are here to stay. Preparing wines for bottling often requires cold stabilization. Orange in winter helps. The vineyard transforms under snow. As Randy Newman says, "everybody goes bad eventually". Thank you from Stephen and Rhonda!